Sometimes one artist tips another artist. In this case Octave Lissner who played with Tango With Lions on a stage in Athens and now lets the world know the band has a new album. So I gave it a chance and look here. Have I ever reviewed a Greek record or band before? I honestly can't remember. The Walkabouts released a live record, recorded in some club in Thessalonica, but that was released years before I started this thing called WoNo Magazine in 2001 with .No. So the answer might just be no. Now I am not one for traditional or more modern Greek music. I've had me enough to last for a lifetime in my marriage. Tango With Lions could come from anywhere, I think. There's nothing reminding me of Greece in the music in the singing, which is simply pretty decent English. The effect is that The Light is reviewed as it should be and not as something exotic, looked at favourably for a different reason. 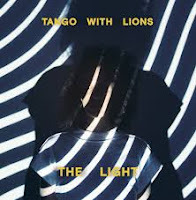 Tango With Lions started in 2007 when singer and bass player Kat (Katerina Papachristou) started making music with different musicians that over the years morphed into a solid band. After releasing two albums in 2010 and 2013, January 2018 brought the third album, now picked up by WoNoBlog. The Light is not so much an original album. The mood of the music reminds me of a musician like Cat Power, the creative layers as wide ranging as U.S folk to Sophie Hunger or Eb & Sparrow. The Light's common denominator being the music having a distinct mood to it. Tango With Lions has the ability to give most of the songs on this album a little extra. The extra can be anything. From a dose of atmospherics, to a distorted guitar, a banjo or a horn. Nearly each song is set apart this way and can lead a life on its own and morph into the whole of The Light. If anything The Light is an intriguing album. It contains a certain level of mystery. 'Back To One' may start like a thousand songs I already know, the piano is even too familiar -some post-grunge song-, the combination of the synth with a clarinet, sets the mood of the album straight away. The other half of the mystery is the (double tracked) voice of Kat. The subtle piano notes that are dispersed through the verses do the rest. The Light has caught me and basically does not let go until the final song, 'L'Ombre' has played itself out. In 'Proof Of desire' an acoustic guitar is introduced as the driving instrument. All is bare, a lot of music that could have been there is not. Adding atmosphere and depth to the song and thus setting it apart. The mood being the constant keeping the music and album together. When the song explodes, mystery is added with hints of the mid-70s Pink Floyd dropped into the songs in small ways. As where later the already mentioned The Walkabouts can be found within the title song. I'll refrain from discussing all the nine songs that make The Light individually. You will have gotten the gist of things by now. This is an album that could have been made anywhere. I will not state that this is a desired conclusion for a Greek band. Fact is that The Light makes for delightful listening and keeps growing, simply because there is some much to discover. So many fine, small and delicate details are woven into the whole. It is details like this that make listening to music a satisfying experience and that is a compliment I can make to Tango With Lions without hesitation.